Orwell admits the issue of when to put in the milk is one that has divided the nation – not to mention the families of the nation. He comes down on the side of adding milk to the cup of tea, because it’s easier to see how much milk you need. This was an argument that raged in my own childhood home. I think my mother thought putting the milk in the cup first, then adding the tea, was somehow more refined. With Orwell to back me, I switched to tea first and have never looked back. When I graduated from Leeds I had no idea what to do with myself. At that point I didn’t want to go on studying, but I stayed in the city and hung about the University with my friends. To pay my way I also took work where I could. One job was with a steel fabricating company. Basically it was a large workshop constructed under one of the arches of a railway bridge in the town. In the workshop the men built things in steel and then drove them out to various building sites to install them. Fire escapes, the frames for factory doors, metal walkways over vats of seething chemicals, support structures for heavy motors at the top of lift shafts. I was the tea boy. My job was to get to the workshop every morning before 8am and brew up the the first pot of tea. Then I had to make tea at least four more times during the day — at 11, at 1pm, at 3 and at 5. Orwell would have recognised the process, though it broke most of his rules. First I filled a pan with water and put it on the stove. Then I added a spoonful of tea (Yorkshire Tea), one spoon for each of the men and one for the pot. Then I added the sugar and the milk and brought the whole lot to the boil. When it was the “right” colour — dark orange-brown — I poured it out through a strainer into mugs for everyone. Though some of the men thought I didn’t put in enough sugar, I think I was quite successful as a tea boy. I was certainly a more successful tea boy than I was lathe operator or a builder’s mate, my other roles in the firm. It was possible to buy English tea at the Naafi shop in the basement of the British Embassy. It was teabag tea, PG Tips. PG Tips was the tea we had at home, but never as teabags. My mother wouldn’t be seen dead serving teabag tea. I bought it with shame. I found it, too. It was an emporium of tea, a palace, a place of wonder where the scent of fine tea enveloped you. As with everywhere else in Vienna, I felt very much out of place. I had travelled from five years of student poverty in England to Bulgaria. There my worn jeans, Doc Martins and winter anorak were clearly western and gave me a certain cachet. That didn’t carry over to Vienna. Now I stood in this polished and scented shop waiting to be served by a polished and scented young man who looked me up and down, but consented to speak with me — in English — and try to sell me something. I wanted some tea, I said. For the morning or the afternoon, sir? To drink with lemon or honey? First flush or second flush? Darjeeling, Oolong, Dimbula? Scented or unscented? I was confounded. Indian? I suggested. I’m not sure what it was he sold me in the end, but I know it made a nice cup of tea. I decided then that I would learn about tea and next time I went back I would be able to order with confidence. But I never did go back to that shop. Still, I’m now able to put a name to the teas I like to drink. Which is what I did and still do, though changes have taken place over the years. Swedes have learnt to make tea with boiling water, they have embraced the concept of different sorts of tea, they have dared to step away from the teabag. On the other hand there was quite a narrow window when you could be guaranteed a cup of decent tea in a Swedish café. Pretty soon things went overboard as Sweden became obsessed with green tea, white tea, red tea, herbal tea and scented tea. There is some really foul stuff that makes your tea taste of cream. Cream! For goodness sake. You should only drink skimmed milk in tea! (That’s one of my golden rules, by the way.) So why would anyone want to make their tea taste of cream? When we moved to Brussels from Sweden at the New Year, we took only two foodstuffs with us. We took a big round tin of Swedish crispbread and we took tins of tea: Earl Grey, Lady Grey, Darjeeling FOP, Lapsang and Södermalm. I thought I’d quickly find a decent tea shop here, but had the tea with me to avoid stress. That worked for a time, but as the level of tea in the tins sank and as I kept on not finding a tea shop, panic set in. No Darjeeling left, no Lady Grey, no Earl Grey. Nearly no Södermalm. I don’t like Lapsang on its own. With no tea to fuel me, how would I be able to write anything? On Monday I was forced to buy a box of teabags (at least they were Twinings Earl Grey). At the last minute (actually yesterday evening) my good wife followed a tip from one of her new colleagues. 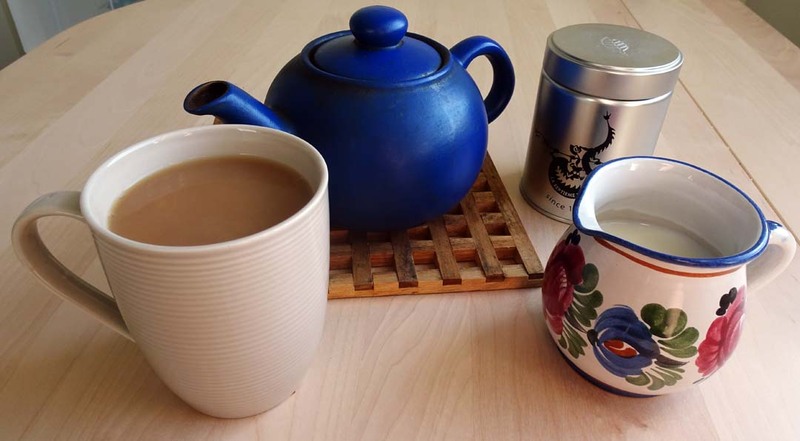 She tracked down a real tea shop and came home with three packets: two sorts of Darjeeling (first and second flush) and a bag of Earl Grey blue flower. Saved! I shall be making an expedition to the same shop in the near future to stock up. … for a nice cup of tea. I originally published this article on the separate At the Quill website. Moved it here (after editing it a little for SEO and adding a nw illustration and header) on 24th October 2018.